Disney Babies Blog: Fun to Travel with Friends! In January, after the race, we spent Marathon Monday at the Magic Kingdom with my college friend (to me and Melissa) and fellow half-marathoner, Ruth. She's a native Floridian and the one who taught me how to run Park Commando, so it was fun to go back to the Magic Kingdom with the person who really taught me the lay of the land. But, this time was different. No Park Commando, no running Space Mountain as many times in a row as possible, heck, we didn't even start with our standard Tomorrowland - no, with Noah, we head straight to Fantasyland. And, knowing the rides like the back of her hand, Ruth had an idea - she decided to take our camera and take pictures of us while we were on rides! She did this for Peter Pan, Winnie the Pooh, and Dumbo! Check out the great view we have from some of these rides. Cute! 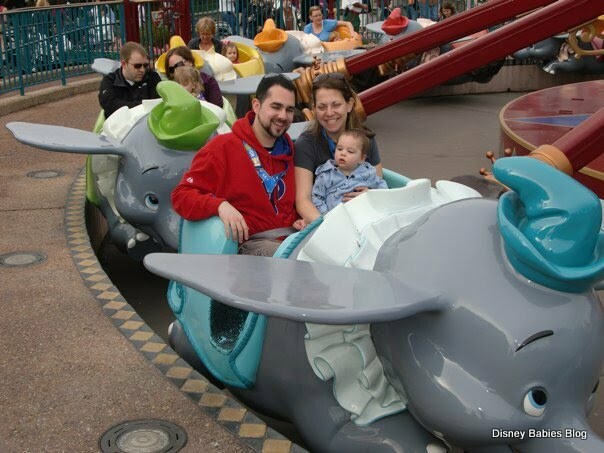 I love that you got pictures on the rides with your family. You will love looking at the pictures years from now.